Back in October, Alex and I were on our way to the mountains of Northwest Arkansas when we began to brainstorm our travel bucket list. Both he and I are extremely grateful to have been raised in well-traveled families, so we sought destinations neither had visited before. Domestically, Portland, Oregon was at the top; and as I browsed airfare and stay options on my phone while on the drive to Fayetteville, I was impressed with the offerings (and the rates.!) So right there and then, on my iPhone, we booked our flight and Airbnb. We were going to Portland. This trip was the first (besides our honeymoon) we had explored a new destination, just the two of us, with no other visitors on the trip. The quality time and freedom in which to spend it was so precious and so rare; we savored every meal, every walk, every spontaneous decision together. Little to my prior knowledge, Portland prides itself on the donut scene. Every Uber driver held a differing yet very confident opinion on the best spot, so we aimed to try a couple. Pip's was precious, serving made-to-order, literally bite size donuts with raw toppings from honey to cinnamon sugar and nutella. Paired with a housemade chai latte, the sweet spot was an excellent start to our day before a drive to Mount Hood for skiing. Alternatively, Blue Star Donuts was wildly popular and an unintentional run-in for us on Mississippi Avenue. A more traditional-style donut with innovative flavors and cult classics, Alex and I opted for a blueberry cake donut with basil and bourbon in the glaze. We were not disappointed. The Vietnamese chicken wings at Pok Pok met sweeping enthusiastic expectations. Prepared in a fish sauce with lemon grass and Asian spices, I quickly became addicted to the sweet and spicy combination. Washed down with a grapefruit martini refresher, the afternoon snack was a colorful delight. For Chanukah, Alex surprised me with reservations to Nomad PDX for Friday night dinner in Portland. We were seated in the kitchen of the contemporary, beautifully designed restaurant. My eyes followed every technique, from the dry ice effects and shave of truffles to the chorizo oil droplets and foraged and preserved vegetables. The courses ranged from crab and duck to tartare and confit. Truly impeccable. I was extremely impressed with our Italian-inspired dinners at Ava Gene's and Renata, both of which were enjoyed over a bottle of red wine with gorgeous plates of pastas and boards of charcuterie. I about died over the delicata squash and ricotta pizza at Renata. Similarly, va Gene's housemade pasta options, tossed with local ingredients and regional flavors, were show-stopping. Go to both, if you can swing it. The topography of Portland and the Pacific Northwest is breathtaking; its city limits are embedded in the rainforest-esque parks and nearby snowcapped mountains; its air is fresh and its ora is calm. Alex and I spent hours upon hours walking and exploring, taking in the scenery and its subtleties. 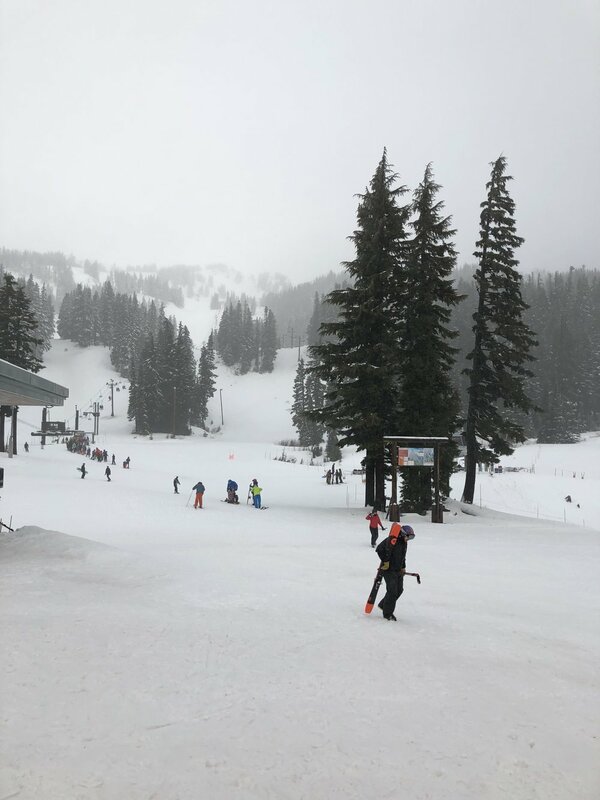 Alex drove us an hour-ish to Mount Hood, where he was able to ski for a mid-day adventure while I proudly camped out at the lodge with a glass of Oregon wine and a cheese board. My "ski bunny" ora wasn't intentional, as I've never before been on the slopes! I can't wait for the opportunity to learn and practice despite my clumsiness. The day after, it was especially fun to see Mount Hood from a distance during our Portland aerial tram ride! Short and sweet, the view was simply insane. The activity inspired us to spend an hour hiking through Forest Park. We got lost in time amidst the 5,000+ acres of woods, talking and treading in our not-climbing-appropriate shoes. The blisters were worth it. We also mozeyed down the Williams District and up Mississippi Avenue for a couple hours, where we enjoyed browsing through woodworking shops and boutiques, nurseries, and coffee shops. Though we were there during daylight, the local music scene at Mississippi Studios looked pretty fantastic. Feel free to share additional Portland recs in the comments!